Go back to bed toss, turn, throw off blanket.... Repeat. That is what it is like trying to sleep with insomnia. 5+ hours later I lay there wide eyed realizing my alarm will be going off in less then 2 hours. I suffered with insomnia from June until September. Non stop, I use to get it once in awhile and it would last for a few days. This time though it was non stop for months. At which point in time my doctor took pity on me. I tried everything! Better sleeping habits, eating certain foods and even meditation. Nothing worked. As it turned out I have hyper awareness anxiety. That is a whole other post, that I plan to save for a different day. My doctor did put me on pills though to help and all I have to say is wow. A huge pressure has been lifted and my bed which I once looked at as the enemy is now my BFF. Now like with all BFF's I want to give my bed the best of the best. Which is why she is covered with the world's great comforter. Oh peaked your interest did I? Have you ever heard of the company SmartSilk? They offer top of the line bedding products, that are All Natural. Their Bedding Collection provides all season comfort and the luxury of sleeping in breathable silk fill along with a soft cotton finish, offering a more comfortable night’s sleep. So here is the bottom line, sleep is important. If you were wondering why I told my story earlier it was because I wanted to let you know that I have first hand experience knowing just how important. You may not know this, but lack of sleep can cause a whole array of health issues. Not to mention it can alter your mood and make you distracted and not alert. The lovely people at SmartSilk wanted to provide the world with bedding that would help us get a better nights sleep. Not just because they are ultra comfortable, but also because they are perfect for people with allergies. All SmartSilk products are CERTIFIED asthma & allergy friendly by the Asthma and Allergy Foundation of America and The Asthma Society of Canada. All of our products have been tested and proven to be free of any harmful chemicals. SmartSilk is a proven barrier to allergens, pet dander and dust mites. SmartSilk will not take on any odours and is completely machine wash and dry-able. For year I've kept a box of tissues next to my bed since I wake up all night to blow my nose, rub my eyes, ect. The bedding products from SmartSilk help to rid these issues since they are made chemical free. And for those of you saying "Hey now we know how companies come by silk!" Let me tell you the people at SmartSilk use no cruel techniques. SmartSilk is proud to confirm that they enforce a NO KILL process in extracting the silk used in all of their SmartSilk bedding products. They harvest the cocoons only once they have dropped from the silk moth. The cocoon is then boiled in water to clean the silk floss that is inside. It is then extracted by hand and allowed to dry. Once the floss has dried it is then spun into a bale of specific weight that is customized to the item to be made. They only use pure 100% long strand grade A silk that has been washed and cleaned without the use of any harmful chemicals. So a company that not only cares about humans and a great night sleep, but also about the little creatures that provide their silk! To me that sounds like a win, win. And what is a great bed, without an awesome comforter? SmartSilk has every size from crib to cali-king. So the entire family can sleep in bliss. 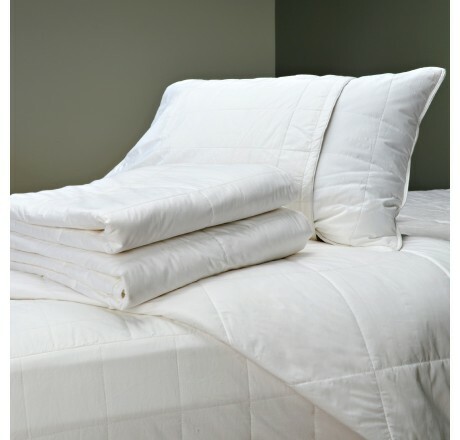 The comforter has a soft cotton finished that feel great against the skin. The inside is infused with SmartSilk signature silk. The comforter is lightweight, but at the same times offers a cozy nights sleep. It conforms to your body and is never stiff or un-comfy. I love that because of the material the comforter helps to adjust to our temperature, meaning it really helps to cut back on night sweats. Plus the material is absorbent and breathable. Keeping us at just the right temperature. Plus the quilted silk technology means it will never bunch up into a uncomfortable ball or lump. This may sound corny, but it feels like I am sleeping with a cloud! Light, fluffy, never stiff, breathable and conforms to my body. SmartSilk keep all dust, pet dander and other allergies our of my bed. It is everything I need for a great nights rest! I have been there people, tossing and turning all night. I know it isn't fun, I know it can be stressful. My advice is do everything you can to get that great nights rest. SmartSilk bedding products offers everything you need to avoid a fitful night. And it gets even better!! A good night's sleep comes at a discounted price with my 40% off coupon!